There are lots of delicious Christmas baking recipes here that will delight one and all. Even if everyone in your family loves something different, you are sure to find recipes for Christmas cookies, bars, squares and tarts that everyone will love. If you entertain during the Christmas and New Year holiday season, you will probably want to make a variety of baked goods. A dessert table or platter with a mix of cookies, squares, tarts and cakes looks great on the table and offers guests a variety of wonderful and tasty options to choose from. Many of these Christmas desserts can be made ahead and stored for a few days or even a week or more. Some can even be frozen without losing their texture. Of course any of these recipes are quite delicious any time of year. The recipes I have gathered here on this page are those I thought are most welcomed during the holiday season. Any of these wonderful Christmas cookie recipes would be great for a cookie exchange with friends too. Some of these no bake cookies are as sweet and yummylicious as chocolate bars. They are a nice bite and great for mixing in with cookies, bars and squares for a fantastic holiday sweet plate. These are the traditional pies served during the holidays. Everyone loves some kind of squares or tarts. They add wonderful variety to a holiday dessert tray. To round out the season here are a couple of other suggestions for great Christmas baking. The chocolate truffles are a “must make”. They are fabulous. For more Christmas baking recipes and ideas browse our easy dessert recipes collection here. 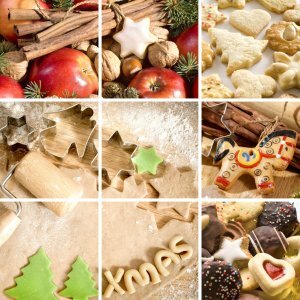 You will find really tasty holiday menu suggestions here. Please feel free to add your own Christmas recipes in the comments section below or on our Facebook page. Whatever you choose to bake, enjoy the holidays!